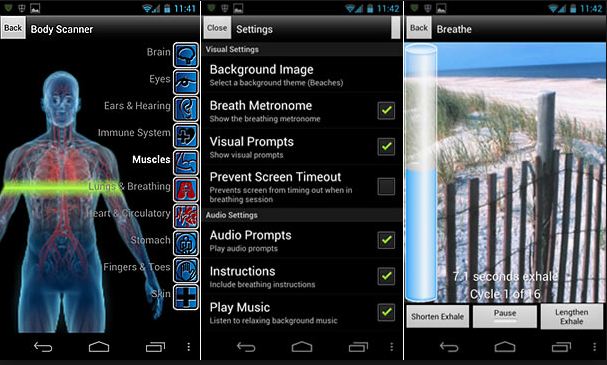 Breathe2Relax is a mobile-based app intended to teach diaphragmatic breathing as a stress management skill. Diaphragmatic breathing is marked by the expansion of the abdomen rather than the chest when breathing. The app visually guides the user and provides audio instructions on how to practice the breathing technique in a way that reduces stress levels. Users can also view a video demonstration before beginning the exercise. The app allows users to set the pace of the breathing exercise at a pace that is comfortable for them, set the pace for inhaling and exhaling, and change the number of practice breathing cycles. Before and after each practice session, the app prompts users to record their stress level on a visual scale by simply swiping a small bar to the left or to the right. Graphs show users changes in their self-reported stress levels. The developers encourage users to practice diaphragmatic breathing regularly so that it can be used during highly stressful situations. Additional features include reading material and videos on diaphragmatic breathing, the biology of stress, and the effects of stress on the body; and wellness tips.